With less than 2 weeks to go before the Tokyo Marathon 2013, I am feeling down, a bit depressed actually… my foot is still sore… how am I even to wing the mara?? Urgh, I dragged my sorry arse to the gym this morning to ‘run’ on the elliptical nevertheless… At least I can report back to my coach that I’m keeping my ‘fitness high’! Anywaz, this notice kills me! Anyway, I did see a cleaner in the gym in Kuala Lumpur drying her feet with the hair dryer, so it might be an’ Asian- thing’… guess I either have to stop washing my hair at the gym or bring my own hair dryer! 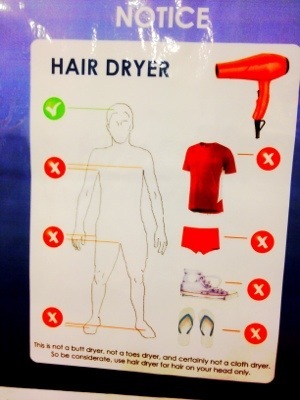 This entry was posted in Hong Kong and tagged Asian-thing, Gym etiquette, Hair dryer, Hong Kong gyme etiquette. Bookmark the permalink.